Will Children Save the Planet? 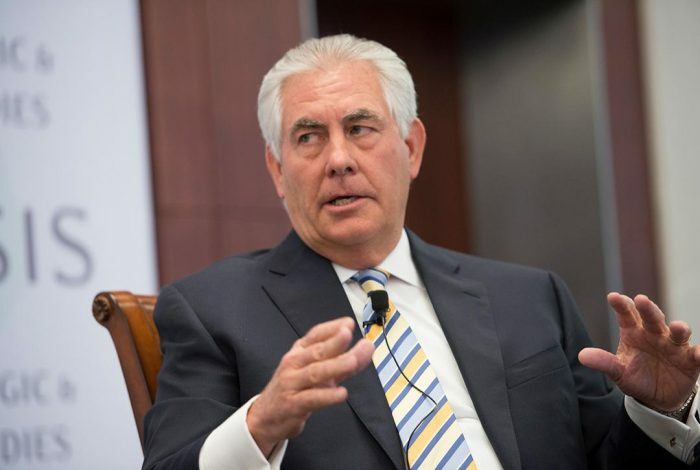 Even before the Senate Foreign Relations Committee grills Rex Tillerson about his close ties to Russia at his upcoming confirmation hearing, Donald Trump’s nominee for Secretary of State could find himself on a completely different hot seat. A group of young people who are suing the federal government to force it to take aggressive action against climate change want Tillerson, the longtime ExxonMobil CEO, to reveal just when the fossil fuel industry knew about the warming of the planet — and what it did to obscure that reality. In November, a court found that there is a constitutional right to a climate system that can sustain human life, that the federal government is responsible for preserving natural resources upon which human life depends and that the remedy suggested by the plaintiffs is appropriate. Attorneys representing the young activists seek to compel Tillerson to testify by way of deposition on January 19, the day before Donald Trump is sworn in as the 45th president. “Rex Tillerson is one of the most knowledgeable executives in the fossil fuel world on the role of his industry alongside our federal government in causing climate change and endangering my youth plaintiffs and all future generations,” said Julia Olson, attorney for the plaintiffs. As WhoWhatWhy reported previously, Exxon knew decades ago that the earth is warming and the devastating consequences this development could have. The company’s initial response to this information was to put more money into climate science research. Then, in the early 1980s, the budget for Exxon’s “CO2 Greenhouse program” was slashed and the company joined forces with groups that spent millions challenging the increasingly robust scientific consensus on climate change. If the attorneys for the young plaintiffs get their wish, Tillerson will have to answer questions about these efforts. The young activists have had some success on the state level and in the courts, as WhoWhatWhy reported. Following those victories, they sued the federal government, arguing that it had violated their constitutional rights to life, liberty and property by relying on a fossil fuel-based energy system in spite of being aware of the grave dangers it posed. The youth alliance has already won a key victory in federal court. In November, a court found that there is a constitutional right to a climate system that can sustain human life, that the federal government is responsible for preserving natural resources upon which human life depends and that the remedy suggested by the plaintiffs is appropriate. The youth alliance demands the implementation of a science-based national climate recovery plan. “The youth of America need to know the truth on how companies such as ExxonMobil continue to use the government to cause horrific harm to our nation’s most vulnerable people,” Gregory added. The case is expected to go to trial later this year. It will be interesting to see how the incoming administration handles the lawsuit. Trump has previously said that climate change is a hoax, and he has stacked his cabinet with fossil fuel supporters and climate change deniers. One thing is certain: While lawsuits like this one (similar actions are being pursued all over the world) have received little attention from the media, TV news and the press will likely be drawn to visuals of youthful plaintiffs facing off in court against government lawyers and fossil fuel executives. Related front page panorama photo credit: Adapted by WhoWhatWhy from Rex Tillerson (World Economic Forum / Flickr – CC BY-NC-SA 2.0) and (Our Children’s Trust).